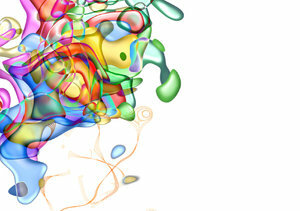 Colourful abstract image. You may prefer: http://www.rgbstock.com/photo/mqD551I/Abstractual+3 or: http://www.rgbstock.com/photo/ne3F1YY/Abstractual+11 This image is copyrighted to me and not in the public domain. Use within licence or contact me. I love those, Thank you very much!!! I love your colors - wonderful! I love the colors! Wow your work is exactly my taste! COLORFUL! Glad to see this type of images again! Flowing liquid colours on white canvas, wonderful image. If I tell you I'll have to kill you. I use PhotoImpact for most of my graphics, and various plug-ins. You are superb at these backgrounds. How did you do this one ? or is that a secret.